and from farther away. An easy way to separate the seeds from the fluff is to collect the fluff and place it in a metal tray and set a match to it. 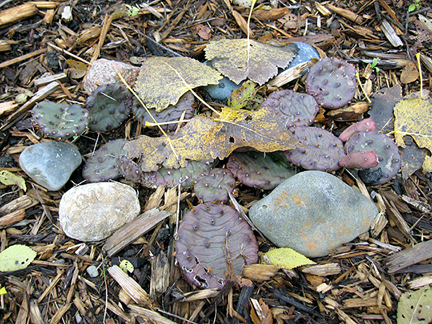 No, really; it's safe and fun — I've seen it demonstrated several times by horticulturists at Matthaei Botanical Gardens. The fluff burns away very quickly and leaves the seeds. 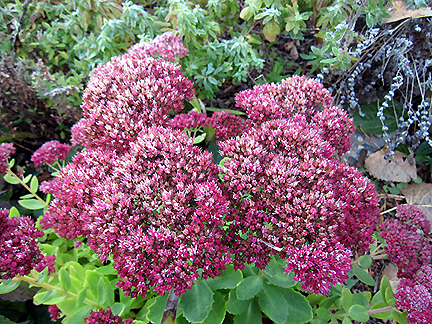 Sedum looks nice with some frost. 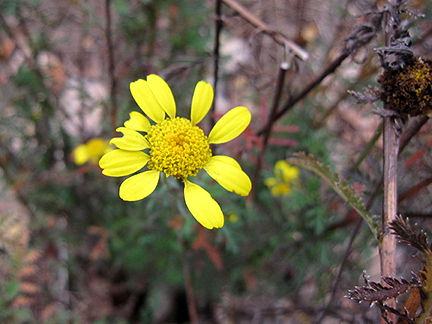 A few golden marguerites are still blooming (they're a great powerhouse, blooming in spring and again in fall). 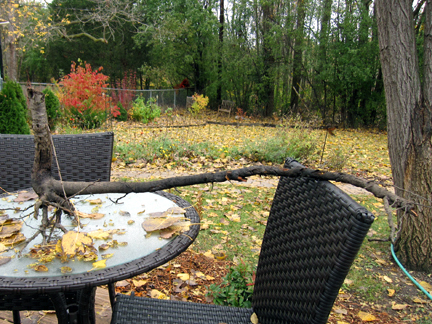 You'll recall me complaining about the hard work of removing buckthorn from my south "wild bed." 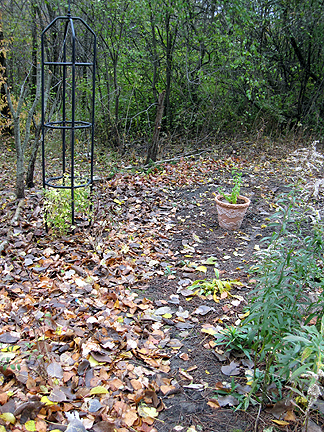 This is the front side of the bed, facing east, which is maybe six by 15 feet and which I had previously cleared and planted. 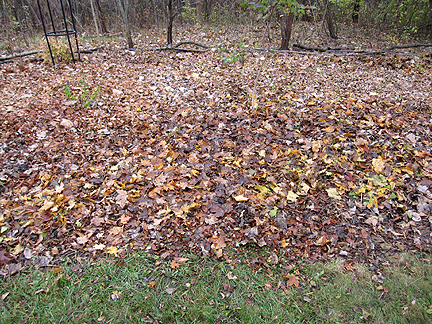 This is the back side of the bed, the area that I've been clearing, facing west. The new cleared area is now about 12 feet wide and 52 feet long (which is a lot of clearing! ); this is the view, from the east end. 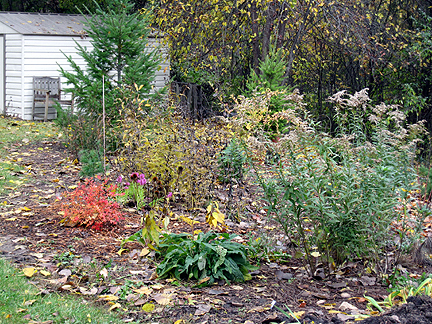 Notice the evergreen shrubs and forsythia. 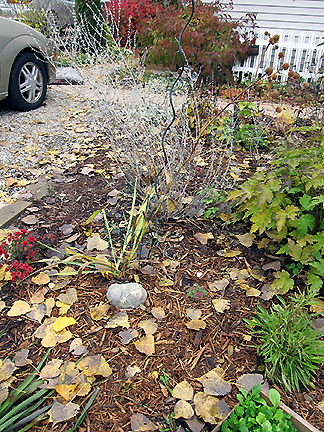 There are some native grasses in there, too, but they're too small to see with the leaves. The same bed, also facing west, but closer to the west end. Notice the clematis and mock orange (waves to Randy!) waiting in the pot to be planted. (It has since been planted.) There are also three deutzias to the left edge, but they have already lost their leaves and aren't noticeable. The same goes for two cut-back tall coreopsis. This view gives a better feel for the size. You can see I left some stems of the taller trees, and laid some really large stems down as a boundary, as there's a public walking path a few feet away. 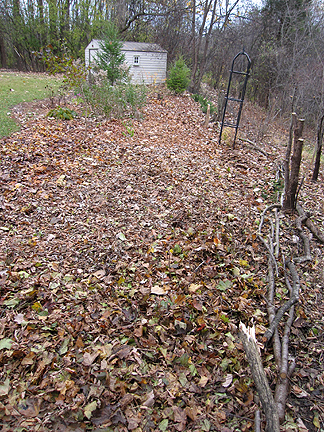 I've put down more leaves as mulch, too! A view of part of the bed, facing south. 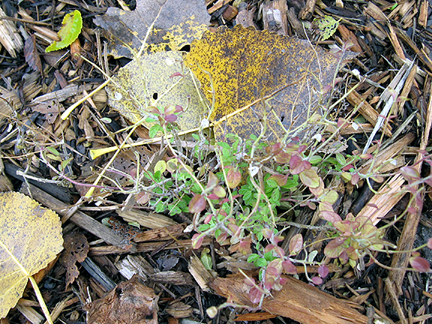 I just direct sowed a Rocky Mountain wildflower seed mix under the area of wet leaves. They'll need the cold to germinate next spring. Hopefully, they'll have enough sun, too. 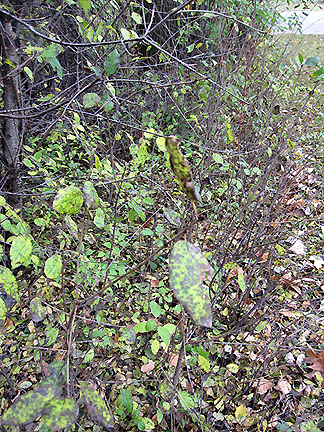 If you're wondering what the whole cleared bed looked like before, it looked pretty much like this area that still needs to be cleared: A thorny thicket of buckthorn (both tree-size and shrub-size), with a few black walnuts, invasive honeysuckles, poison ivy, and grapevine thrown in for fun. Eep! These are the type of roots I've been struggling with. The short upward facing growth is the actual trunk of the tree, cut down. The thing coming out to the right is the root; only a small part of the root, but see how long it is?! I also struggled with the roots of walnut trees, which make the buckthorn roots look like spiderwebs in comparison! 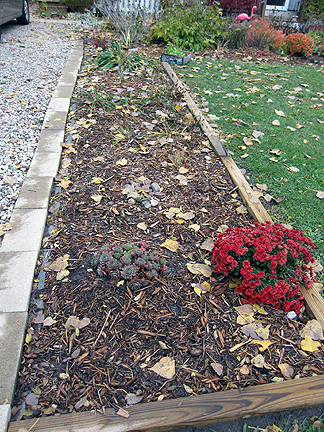 I created borders for and planted a new xeric/Colorado bed. I was very taken by Colorado and am trying to get a small feel of it in Michigan. The bed was previously much shorter and held tomatoes. It's one of the few full-sun locations in my yard, and because it's next to the hot driveway and because my rain barrel soaker hose doesn't reach to this location, it's very dry. Not that I'm not a big waterer of my garden plants in general (unless newly planted/transplanted), so my whole garden is xeric in a way, but this bed is for extra-xeric plants, LOL! (The mum will be moved out in spring.) What's in there, you ask? I also planted from foxtail lilies, which to me are very quintessentially Coloradan (or at least Denver Botanic Gardenian! ), but they are tubers so I can't show them until spring when they bloom. I emptied all this year's lovely compost (from the bin to the left of the photo) onto what will be my sole veggie bed next year. 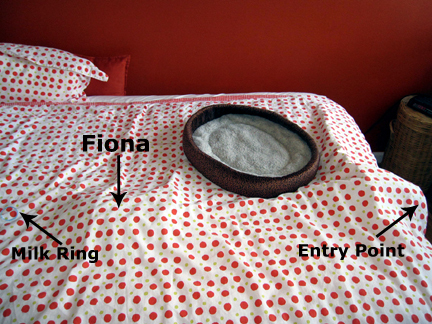 Yes, Dr. Watson, this scene alerted me to two facts: 1) James had been playing with the milk ring (he likes to leave it on the bed for me, thinking it's a kill) and 2) Fiona was sleeping under the covers. You can see her bump, though she's quite slender, and her entry point. Wow, so much to talk about. First of all your gardens are looking good. Ever since you posted on buckthorn I see it everywhere now. Not in my yard though-a good thing. The yuccas look good. Cute little cats-though I only see the hump! I struggle with locust (black and honey) like you do with buckthorn. Miserable stuff. Will be interested to see how your xeric plants do. I've slowly switched most of my garden to xeric. Of course now comes the second wettest summer/fall in history. Can't win. Hi Monica.....I really love compost...I am known by my family as the compost queen. You have worked so hard. I cannot believe how much you have cleared....well done. I know from experience the aches and pains you get with that amount of digging. How are you?? I spent hours playing with milk pods as a child ... this brought back many lovely memories, Monica. Lots of good stuff going on in your gardens. Happy November dear Scorpio friend! I love your photos of the milkweed! The first one looks like an abstract painting - beautiful! Those buckthorn sound horrendous! Glad you have got rid of most of them. What a chatty post. You have been so busy. Your cat is so cute there under the covers. My Jack Russell Terrier used to lay under the covers like Fiona. I don't how she didn't suffocate, but she loved it. Happy Mish Mash Monday to you, too! I hope you had a great weekend? 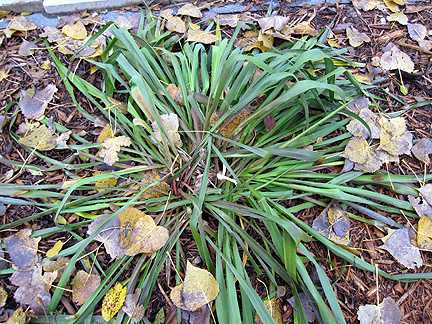 I can't believe how many invasives we have in our gardens! Too many! 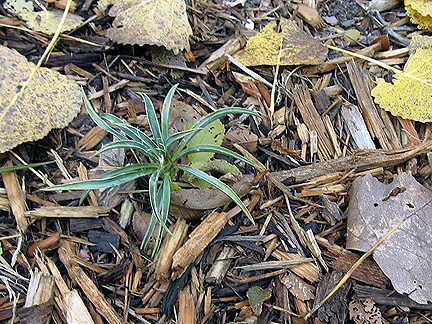 I am so glad buckthorn isn't here, too....the honeysuckles, vincas, euonymous and now, stiltgrass are already over whelming. Monica...Your hardwork shows and the shrubs and plants you've added will be gorgeous. Love the xeric plants you have~~I planted Hesperaloe parviflora in my garden and hope it does well... love its tall red flower. 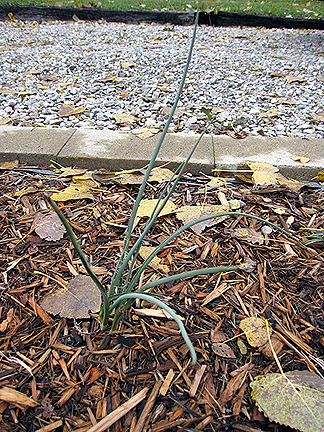 Like Marnie said...My xeric plants have had a time in our unusually wet summer and fall. We shall see what the winter brings our way. I enjoyed all your mishes and mashes. I think the milkweed fluff photos are my favorites. You sure have kept busy with all your planting areas. I can somewhat identify with your clearing out endeavors. The neighbor across the street cut down trees and such in the area he invited me to garden, but we are still cutting back the trees that want to grow from the leftover roots in the ground. We have done some digging, too, and gotten out roots like the one you showed, but not quite as big. I had to laugh at the last photo. Lot going on! I sure hope my milkweed will blossom and set seed like this one day. So far, it's lingered, then gone dormant. Well, there's always next spring. So many topics in one post... very bussy time for you, I imagine. 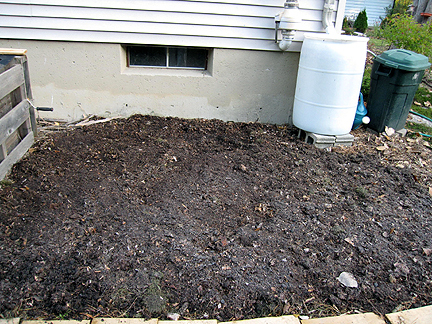 Love your compost, it looks great, vegetables will enjoy it for sure! Wow, Monica, you have accomplished a lot this fall! I am picturing you as Monica Bunyan...is there a Blue Ox hiding out in the photos somewhere? :) Can't wait to see the new xeric bed in the spring. You're inspiring me to bring a little Arizona home to my house. 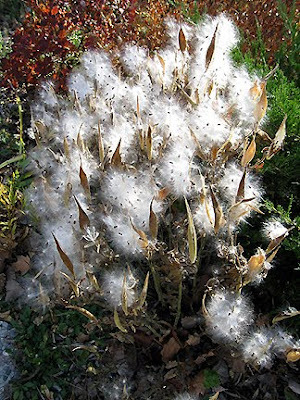 I used to play with those milkweed pods as a girl--fun to blow all the fluff away (I was easily entertained). I'm not artsy-craftsy, but I've seen people use the stems of pods in dried flower arrangements, too. You're right, the the milkweed fluff simply looks beautiful. I also like frozen sedum. You have really done some hard work. However, I am a little sad, a little sorry for the vitamin-rich sea buckthorn. But I look forward of the wildflowers bloom in the next year. Hi Monica - wow, but you've been busy ... that is a HUGE bed you've cleared - respect!!! That fluffy milkweed stuff looks like great fun - it's really lovely to look at and you can let loose any pyromaniacal tendencies too :) We don't have that over here, so I'll just have to enjoy the thought of you setting fire to it! Good compost! I LOVE compost - I emptied one of my 3 bins onto my veg garden last week and have already started to fill it with 'stuff'. Your xeric bed is going to look great. Great mish-mash again! BTW, we say that too, only it's spelled Mischmasch. ; ) That's a looooong new border to plant. Yay! Fiona knows how to spent a day. I love the bed cover, those spots are so cheerful. I hadn't realised until this post how big your garden is - and getting bigger, dug-out bush by dug-out bush, it seems! What is a milk ring? 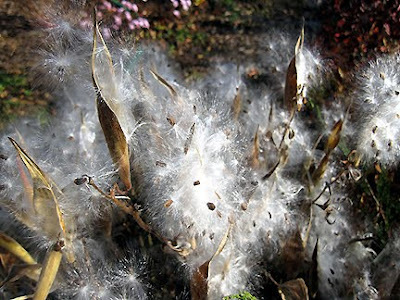 I do love the pics of the Milkweed...so pretty...and brings back memories as a child of blowing them into the air. 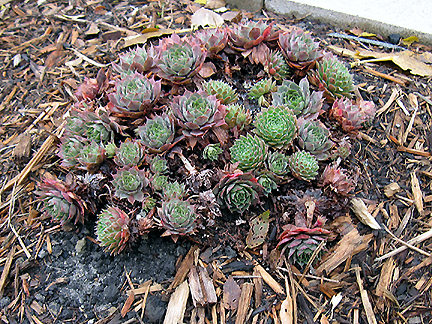 Your Hen & Chicks are very nice. You have been very busy cleaning and clearing. All your leaves on the beds look very autumnal. 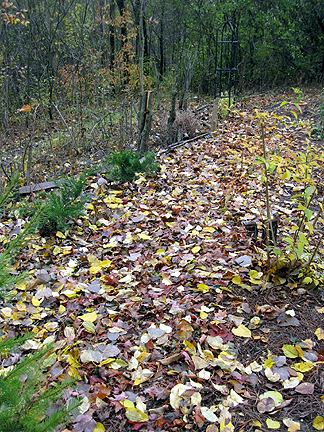 I absolutely adore leaves for compost--come to think of it--I just love compost. Funny the things a gardener can wax poetic about. Monica Ventura, Cat Detective. Ha! Ha! Too funny. I loved that movie (Ace Ventura). Very nice of Fiona and James to play along with you. I am sure they were just humoring you to give you some mish to add to the mash for Monday's post. Holy cow, you've been busy! I also am contending with my gardens getting more shady. Silly trees! Your yard is so gorgeous; I don't think I had realized before how much space you have, and I love the wild feel of parts of it. Can't wait to see the results next year! Your xeric bed's going to be great. I'm looking forward to one day when my baby prickly pear is as big as yours. I can understand why you want a little piece of Colorado at home. It's such a beautiful place. I almost moved there in the '70's. Congratulations on all your hard work. Everything looks great. Hopefully you can relax now (?) and look forward to spring! I've read that fire tip, but have yet to actually do it myself. I feel a new blog post coming up. Maybe with video and guest appearance by the Chicago Fire Dept? It is so funny when cats climb under things like your blankets and sheets, and what makes it even funnier is that the cat thinks that it's funny too! This is one of My Cat Panini's favorite games. She likes to move from one side of the bed to the other like a mole underground. This makes me laugh until it hurts! because it looks so silly"
Her favorite toy is also a Milk top ring.